Jorge Luis Borges, as any reader of his stories knows, had a lot of ideas. Some of his ideas must have seemed pretty fantastical when he wrote stories around them from the 1920s to the 1950s. But their mythic qualities have made them endure, and now Borges' imaginative, technology-rich 21st-century fans have started to put their philosophical speculations into practice: you may remember, for instance, the online Library of Babel, ultimately to contain every possible 410-page book, which we featured in April. Borges also came up with intriguing and then-untestable notions about, in the words of Vice's Daniel Oberhaus, "the importance of metaphor and its limitless possibilities in language. Borges theorized [listen above] that despite these boundless possibilities for poetic language, there were nevertheless distinct patterns of metaphors that kept cropping up — a favorite example of his being the metaphorical equivalence of 'stars' and 'eyes.'" 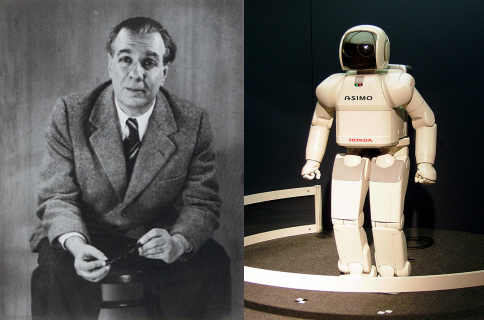 Now a site called Poetry for Robots, a joint effort between Neologic, Webvisions, and The Center for Science and the Imagination at Arizona State University, "seeks to put Borges’ theory to the test, asking on their website whether it is possible to teach machines the poetic quality of human language." "What if we used poetry and metaphor as metadata?" asks Poetry for Robots' front page. "Would a search for 'eyes' return images of stars?" To find out, the site has begun crowdsourcing poetry from its users, who they've asked to submit pieces of verse (150 characters or fewer) prompted by a series of images posted there: you can write your poetry in response to the open ocean, an urban landscape, a cappuccino, paths diverging in a wood, or 117 other actual images meant to draw out textual imagery. Then comes the test: can computers learn to make the same poetic associations humans do between word and image, image and word? If the Borgesian vision of metaphors existing in patterns holds true, then they will — computers perform few tasks better than pattern recognition, after all. This could lead not just to, say, artificial intelligence that can compose and even appreciate poetry, but poetic-language search engines — a deeply artistic extension of the seemingly frustrated natural-language search engine efforts pioneered by the likes of Ask Jeeves. And if none of that works out, we'll still have witnessed a fascinating thought experiment, just like Borges' stories themselves. The writer's original thoughts on the subject will certainly remain compelling, and you can hear them in his 1967-8 Harvard lectures on poetry (from where the clip above came) that we first featured here a few years back. Who knows — they might even give literature-inclined computer science students, or computer science-inclined literature students, the idea for their next big project.